Vancouver leads our rankings for the fourth consecutive quarter with prime prices in the city increasing by 26% in the year to March 2016. A severe lack of supply is creating an upward pressure on prices. There is little evidence that February’s increase in land transfer tax, from 2% to 3%, on all purchases above CAD2m, has dented sale volumes. Record-low interest rates and cheap finance fuelled demand in Shanghai leading to price growth of 20% year-onyear, however, in March the government tightened mortgage lending rules which is likely to result in slower growth in the second quarter. Australasia proved the world’s hottest world region in the year to March 2016 with prices rising 12% on average; this is despite the introduction of a new fee for foreign buyers. 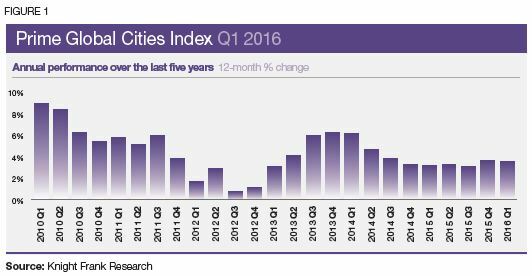 Prime prices across the 35 cities increased on average by 3.6% in the 12 months to March 2016. The index entered a period of steady growth in 2014, consistently recording annual growth of 3-4% in the subsequent seven quarters (figure 1). New York and Miami, where cash buyers now have to comply with new transparency rules above set price thresholds, continue to record steady price growth. Prices in prime central London increased by only 0.8% in the year to March, its lowest figure since October 2009, when a 3.2% decline was recorded as the market readjusted following the collapse of Lehman Brothers. The more muted performance is as a result of a series of tax changes and a preceding period of exceptional growth. As of 1 April 2016 buy-to-let investors and second-home buyers pay an extra three percentage points of stamp duty on any UK purchase. Although prices in Paris dipped 3% in annual terms, prices stabilised over the last quarter as French buyers, having recognised value in their capital’s market, increased their market share. New regulation in the form of measures to improve transparency, new taxes or fees for foreign buyers are increasing in number. However, the impact on the market of such measures is largely dependent on market fundamentals and where each market is in relation to its property market cycle. 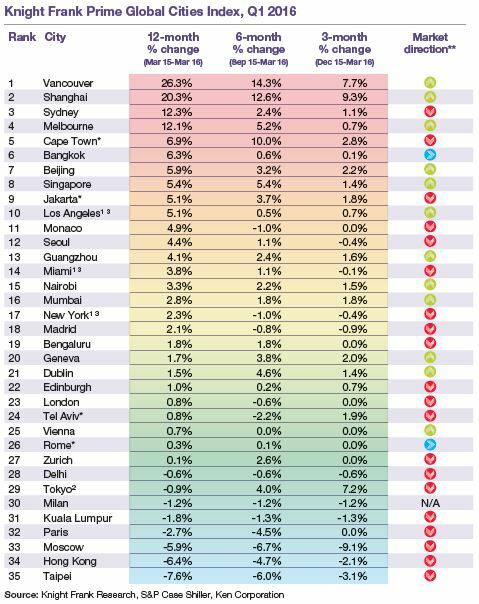 The Knight Frank Prime Global Cities Index enables investors and developers to monitor and compare the performance of prime residential prices across key global cities. Prime property corresponds to the top 5% of the wider housing market in each city. The index is compiled ona quarterly basis using data from Knight Frank’s network of global offices and research teams.